The highly recommended Luigi’s Pizza and Pasta came up on our food wheel (I kid, there’s no food wheel, just a list of places people tell me I need to check out) this morning, so around noon we ventured to Bryant for lunch. I thought this was just a regular neighborhood pizza place until we walked through the doors and saw the fine pendant lights, dark furniture and painted walls. Some time and effort’s gone into this place, that’s for sure. And if the menu’s to be believed, Luigi’s is in its 40th year. After we were seated, our waitress quickly brought us iced tea and garlic bread with cheese ($3.99). While the serving was about average, the amount of gooey cheese atop was certainly generous. The marinara is of the mature variety, cooked through with love and devotion and that sort of flavor you only find through years of patient work. My husband ordered up the day’s special, Beef Tortellini (usually $8.49 but this Friday on special for $6.99), and was welcomed with a large bowl of soft tortellini packed with beef and cheese under a very meaty red sauce. I say soft -- I mean soft. Very soft. As if they’d been hand-rolled this morning and never dried. I’ve made tortellini before -- it’s definitely a labor of love. These were great. His bowl was served up with a side of crispy and soft garlic bread. 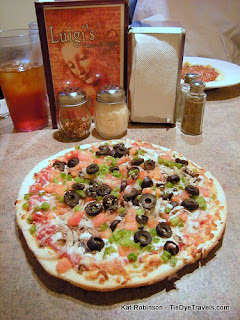 Hunter and I split a medium (10”) Veggie Pizza ($8.99), a cracker-crust style hand tossed pizza light on the cheese but heavy on the vegetables, especially the fresh tomato, onion, and black olives. Green peppers and mushrooms also dotted the affair. The mature sauce paired with the fresh tomatoes really adds to the “garden” sense of the dish. It did cry out for some Parmesan cheese, which was available as it should be at a good pizzaria. Hunter demolished one of the six slices. I had a couple myself, and the rest we took home. We decided what the heck, there’s a homemade dessert on the menu and we’re going to try it. So we shared a slice of Blueberry Pie a la mode ($2.99 by itself or $3.99 with ice cream). Instead of the pastry-pan sort we’re used to, this blueberry pie was a slice of blueberry pizza pie, flat and with crumbles across the top. The texture of the crumbles is like good steel-cut oats, not too sweet but very nice against the berry paste of the blueberries and the crisp crust. All in all, Luigi’s was pretty darn good, and I’m surprised I’ve never been there before. I want to try the Mandarin Chicken Salad next time I go, along with the Ravioli Espanol, which says it’s supposed to be cheese filled ravioli with a touch of jalapeno fried and covered in meat sauce. Sounds nom. You’ll find Luigi’s at 22000 I-30 in Bryant -- that’s on the westbound access road almost at the halfway point between Reynolds Road and Alcoa Road. They’re open 11 a.m. to 9 p.m. Monday through Saturday and are closed on Sunday. For more information, call them at (501) 847-1110.